How the Turks shed their blood, fighting the Jihad for Four Hundred years and finally gave up and embraced Islam, and later became the tormentors themselves to carry the bloodied tradition of Jihad into Anatolia (modern Turkey) and the Balkans up to Austria. Mahathir Mohammad, former president of Malaysia declared at the opening of the 10th Session of the Islamic Summit Conference at Putrajaya on Oct 16, 2003: "We need guns and rockets, bombs and warplanes, tanks and warships. We may want to recreate the first century of the Hijrah, the way of life in those times, in order to practice what we think to be the true Islamic way of life. .1.3 billion Muslims cannot be defeated by a few million Jews. There must be a way. And we can only find a way if we stop to think, to assess our weaknesses and our strength, to plan, to strategize and then to counter-attack. As Muslims, we must seek guidance from the Al-Quran and the Sunnah of the Prophet. Surely the 23 years’ struggle of the Prophet can provide us with some guidance as to what we can and should do." 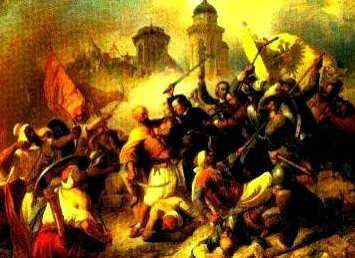 Today we read in history that the Ottoman Turks carried the Jihad into Europe. The Turks besieged and sacked Constantinople. To many of us, the Turks before Ataturk reformed Turkey into becoming the Muslim world’s first secular republic, were ruthless Jihadis, whose king was the Caliph till 1924, when Ataturk abolished the Caliphate. But we know little of the bloodied struggle that the Turks waged against Islam for three hundred years from 650 up to 1050. The first clash of the Turks with the Islamic Jihad took place when the Muslims in their surge through Persia reached the borders of the Sassanid Empire in Khorasan, near Central Asia. In those days the Turks ruled Central Asia. They have been referred to as Turanians by the ancient Persians of Zoroaster’s time. The Turks were so to say a multi-ethnic tribal cluster who were united with the bonds of language. Since ancient times, apart from grazing cattle, the Turks also used to attack settled people in Persia and live off the booty. Tengri is the god of the old Turkic, Mongolian and Altaic religion named Tengriism. The Mongols called him Tengri, (depicted as Blue Sky) was the highest God of Turks and Mongols. The name "Tengri" -(Tana-Gra) means "Ruler, Master of the Land"; there might be some connection with the Sumerian word for god Dingir. The symbols of Tengri were a cross (betraying Christian influences), the skies and the sun. It is often confused with a sun-worshipping religion, but the sun is merely a symbol of Tengri. Deep in history neither the Mongols nor the Turks were Muslims, but in fact had waged a bloodied struggle against Islam. The Turks and Mongols were neighbors and had mixed ancestry since antiquity. Both held Central Asia between them when the Arab Muslim invaders appeared on the scene, after over-running the Persian Sassanid Empire in the year 651. Ironically the Turks had to struggle with Islam which came to them through the medium of the Islamized Persians who had been newly converted to Islam at the point of the sword by the Arabs. In modern Turkish, the word "Tanri" is used as the generic word for "god", and is also often used today by practicing Muslims to refer to their God in Turkish as an alternative to the word "Allah", the – originally Arabic – Islamic word for "God". Khan is a typical Turkish royal title and is, by default today, considered to be a Muslim name. But Genghis Khan and Hulagu Khan were not Muslims, they were in fact were inveterate enemies of the Muslims. They laid waste a large swathe of the Islamic crescent in the 13th century, till their descendants were ultimately defeated by the Muslims and were forced to convert to Islam. After this conversion, till today we have come to believe that the name Khan is a Muslim name and that the Turks and the Mughals (Mongols) have always been Muslims. Deep in history neither the Mongols nor the Turks were Muslims, and had waged a bloodied struggle against Islam before their forcible conversion. The Turks and Mongols were neighbors and had mixed ancestry since antiquity. Both held Central Asia between them when the Arab Muslim invaders appeared on the scene, after over-running the Persian Sassanid Empire in the year 651. After clearing these pockets of Persian resistance, the Arabs made the main Persian town of Merv the target of attack. Merv was the capital of Khurasan and here the last Sassanid king Yazdgard had sought refuge with his courtiers who had being fleeing before the advancing Arab Muslims, since the Arab invasion of Persia in 637 after the disastrous battle of Qadisiyyah. The Persian army was now in tatters and in no position to put up any effective resistance to the invading Arabs. On hearing of the Muslim advance, Yazdgard left for Balkh. No resistance was offered at Merv, and the Muslims occupied the capital of Khurasan without lifting their swords. b commander Ahnaf that the practice with the Turks was that the war commenced at dawn and before the war could start three heralds blew bugles and then the Turkish force marched to the battle. To subvert the Turks, before the night of the war, Ahnaf hid himself in a safe place outside the Turkish camp. As soon as the Turkish herald came out of the Turkish camp to blow the bugle, Ahnaf overpowered him and killed the Turk with his sword. When the second herald came he met the same fate. The third herald also met the same fate. So on that day the bugles did not blow for the Turkish army. In the space of 650-1050 AD a number of events of importance transpired in Central Asia. These four hundred years were the fiercest in the Turkish struggle against the Islamic Jihad. The next four hundred years were to see the gradual transformation of the pagan Turks into Muslims. The Turks shed their blood fighting the Jihad for four hundred years but finally gave up and embraced Islam, to later become Jihadis themselves to carry the bloodied tradition of aggression and forcible conversion into Anatolia (modern Turkey) and through the Balkans up to Austria and Poland. The next three hundred years witnessed the untold story of the Turkish resistance to Islam. Ironically the Turks had to struggle with Islam which came to them through the medium of the Muslim Persians who had been newly converted to Islam at the point of the sword by the Arabs. In the space of 650-1050 AD a numbers of events of importance transpired in Central Asia. These four hundred years were the fiercest in the Turkish struggle against the Jihad. The next four hundred years were to see the gradual transformation of the pagan Turks into Muslims. The Turks shed their blood fighting the Jihad for four hundred years and finally gave up and embraced Islam, to later become the tormentors themselves to carry the bloodied tradition of Jihad into Anatolia (modern Turkey) and Balkans up to Austria and Poland. In the year 750, an important event that transformed Central Asia. This event was the overthrow of the Umayyads Caliphate and its replacement by the Abbasid Caliphate. While Umayyads of Damascus were Arabs who had descended from Abu Sufyan the Chieftain of Mecca at the time of Mohammed. The newly converted Zoroastrian Persians wanted to regain their pre-eminent power in Persia. They organized themselves and marched against the Umayyad army. The two armies met at a place called Zab. Here the Persian Abbasids defeated the Arab Umayyads and established a new caliphate near Ctesiphon the site of the ancient capital of the Sassanid Persians. They named this city Baghdad which was to be the capital of the Abbasids from 750 up to its sack by the Mongols in 1258. 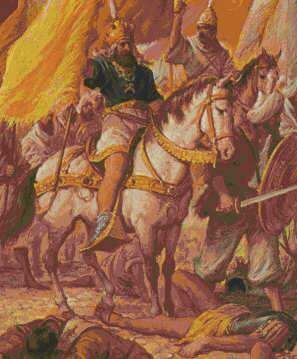 A leading commander of the Abbasid army was a Zoroastrian convert to Islam who had assumed the name Abu Muslim. He played a leading role in the war and deposed the Umayyad caliph, and placed the Persianized Abbasids as Caliphs and as the head of the Muslim world. With this revolution the leadership of the Muslim world had passed from Arab hands into Persian hands, a leadership which they had lost a century earlier, when the Arabs had destroyed the Sassanid Persian empire. An important change now was that the Persians who as Zoroastrians a century earlier were victims of Islam had now embraced Islam and had become the new vanguard of the bloodied creed of Islam. Their victims were to be the Turks of Central Asia. Shortly after victory at the battle of Zab, and the establishment of the Abbasid Caliphate at Baghdad, Abu Muslim was commissioned to conduct a Jihad in Central Asia to exterminate the Kaffirs once and for all. It was a great low point for the Western branch of the Blue Turks. Their great Khan Su’lu who was a bulwark against the Moslems and the Chinese in the wars of 720 and 723, was assassinated by the Arabs. 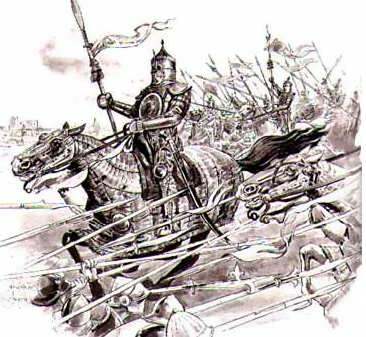 The pagan Turkic rulers of Samarqand and Bokhara came under a heavy assault from the ghazis after the fall of Su’lu when the Arabs with 300 giant trebuchets stormed the cities and forcibly imposed Islam with the destruction of the pagan places of worship. Archaeological evidence shows that these Turkic cities were cosmopolitan with Buddhism, Hinduism, Zoroastrianism and the Tengri cults of the Altaics were the various creeds that were practiced. 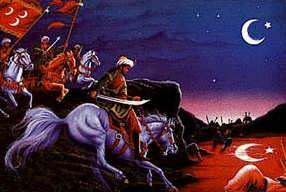 The Arabs under Abu Muslim savagely crushed, the last attempt made by the populations of Samarqand and Bokhara to rid themselves of the murderous Muslim Ghazis. Abu Muslim sent his victorious commander of these wars, Ziyad ibn Salih, with a band of 40000 ghazis, to wage a Jihad on the Chinese. The Arab army marched from the south towards Talas. The Chinese general Kao (of Korean origin), decided to resist the Muslim invasion and marched towards Aulie-Ata on the Talas river with 100,000 Chinese troops in cavalry and infantry divisions. On July 10th 751 AD the Arab and Chinese armies took to the field in Aulie-Ata on the backs of the Talas river. The Chinese cavalry seemed to initially overwhelm the Arab cavalry, but the Arabs had worked out a deal with one of the many Turkish contingents of the Chinese army viz., the Qarluq Turks, by promising them wealth and freedom in return for embracing Islam and betraying their Chinese masters. The Qarluqs who held a grudge against the Chinese for having reduced them to vassalage, viewed this as an opportunity to throw off the Chinese yoke by using the Arabs, and had planned to later throwing off the Arab yoke as well and regaining their freedom from both the Chinese and the Arabs. The Qarluq Turks later played the main role in converting other Turkish tribes notably the Seljuk Turks to Islam. At the battle of the Talas river where the Arab and the Chinese armies clashed, the Qarluqs who were a part of the Chinese army, opened a breach in their own ranks and allowed the Arabs to ford the river and helped them to encircle a part of the Chinese infantry butchering it to the last man. Retuning to Turkish roots by taking on ethnic Turkish names in place of Arabic Islamic names. The Qarluq archers then surrounded their paymaster the general of the Chinese army Kao and treacherously shot him down. Now the Arabs followed their heinous practice of sticking the severed head of an enemy and parading it before the enemy army. The Chinese not being used to such grisly war tactics, fell into confusion and disarray, not knowing who had betrayed them, and their General Kao. They broke ranks and fell back into confusion, shaking the Chinese center, which was rapidly assaulted by the Arab heavy cavalry and destroyed. Thus due to Muslim subterfuge and savagery the infallible Chinese war machine gave way under combined assault of the Arabs and the traitor Qarluqs, and they faced a heavy rout. From behind, the treacherous Qarluqs fell upon the Chinese baggage trains and supplies carrying away all they could and receded back into the steppe. The Arabs rounded up tens of thousands of Chinese and their non-Qarluq Turk allies and took them to Samarqand from where Abu Muslim sent them to Baghdad and Damascus to be sold as slaves, each worth a dirham. One Chinese survivor mentions being kept as cattle in the Arab prison camps. Abu Muslim and Ziyad made huge financial gains out of this slave trade and used it to pay their armies. More importantly the Arabs forced the Turk and Chinese prisoners to teach them the art of making siege trains and catapult machines, which the Islamized Turks were to use successfully in their attacks on the Byzantine cities. The Qarluq Turks wanted independence from the Chinese so they made a pretence of embracing Islam to obtain Arab support to defeat the Chinese. The Qarluqs had planned to later throw off the Arab yoke as well by repudiating Islam and regaining their freedom from both the Chinese and the Arabs. But little did the Qarluqs realize that in working out a deal with the Arabs, while they would succeed in throwing off the Chinese yoke, they would have to bring themselves into the fold of Islam, from which there was no escape! The Qarluqs were forced to remain Muslim and whenever any of them reneged their Islamic faith, they were put to death while the luckier among them were enslaved by the Arabs and Persian Muslims. The later history of the Qarluqs was as Muslims who resigned themselves to remaining as satellites of the Arabs after having thrown off the Chinese yoke and with it also the only possibility of liberating themselves from the grip of Islam. It was this devious conversion of the Quarluqs that triggered the conversion of the greater Turkish nation to Islam in the next three centuries from 750 to 1050. The Turks who had zealously retained their freedom from their neighbors the Chinese, and the Zoroastrian Persians for more than a millennium, finally began succumbing to Islam due to a tactical pretense of the Qarluqs of embracing Islam, for securing Arabs support and throwing off Chinese suzerainty. A deal that proved costly for Turkish independence that was now permanently enslaved into the prison of Islam. The Turks henceforth would remain satellites of the Arabs, a position they sought to reverse, by themselves becoming more aggressive champions of Islam, and reducing their Arabs masters to vassalage status when they established their Seljuk and later Uthman (Ottoman) dynasties. But before they would finally resign to their fate to being Muslims the Turks waged a bloodied war against the Muslim incursion of their homeland in Central Asia. After the Battle of the Talas river, the Arabs captured many of the non-Qarluq Turks who were allies of the Chinese and deported them as salves to Baghdad. They are reported to have totaled up to seventy thousand. Not only were these enslaved Turks were forced to become Muslims, but enslavement was the tactic used by the Islamized Turks to convert the non-Muslim Turks to Islam. The next Turkish clan to be converted to Islam was the Seljuks. They were a proud imperial clan among the Turks, and after the conversion of the Qarluqs to Islam, it was the Seljuks who held the banner of Turkish resistance to Islam. The Seljuks remained unsubdued for another century and half. But the Arabs, Persian and Islamized Turks mounted many bloodied campaigns against them and other non-Muslim Turks who were allied to the Seljuks. In this series of battles the fortunes fluctuated from one side to the other, at times the Muslims were victorious and at others the Turks emerged victorious. In this unwritten chapter of the Turkish resistance to Islam, the Muslims (who in this case were mainly the Zoroastrian Persian converts to Islam), devised new tactics and subterfuge to enslave a proud and fiercely independent people which characterized the Turkish clan. In this battle the Turks did not lack in bravery, as they were born warriors and spent a large part of their lives on horseback. But whenever the non-Muslim Turks were victorious, they destroyed the Muslim camps, slaughtered their armies, destroyed their cities, and torched their fields, but it did not cross their minds, to enforce any religion on the defeated Muslims. Those of the Muslims that the Turks set free, either went back to the Muslim controlled cities, or stayed on in the Turkish areas and attempted to spread Islam. A mindset that was totally absent among the non-Muslim Turks. (It was only when the Christians of Europe liberated Muslim lands, did they attempt to re-convert the Muslims to Christianity.) But the pre-Islamic Turks knew of no such tactic and they made no attempt to roll back the tide of Islam when they were victorious over the Muslims. the non-Muslim victors and ultimately defeat them. So whenever the Muslims are defeated and subjugated they need to be made to give up Islam, at the pain of death if necessary. But Islam has to be wiped out of peoples minds if the victory over Islam has to be consolidated and made permanent. As long as a person remains a Muslim, he/she remains an ever present danger to any non-Islamic (civilized) way of life. In their struggle with the pre-Islamic Turks the tactic of the Muslims was to use every victory to press Islam on the defeated Turks. At every negotiation with the Turks, when the Turks faced a defeat, the Muslims would ask for custody of the princes and princesses of the Turkish royal family on the excuse of holding them as a guarantee that the Turks would keep their word given during the negotiations. These royal captives would be brought up in the Islamic tradition and their minds jaundiced in favor of Islam. In many cases when their Muslim captors were satisfied that the royal captives had mentally accepted Islam, the Shahada (declaration of the acceptance of Islam) was pronounced to them, and they were released to return to their kingdoms, whenever they had to ascend the throne in their clans and tribes. Most important of all, Ataturk visualized that in future there could be folks like Abdullah Gul and Erdogan who might want to undo the revolutionary secular reforms initiated by Ataturk and roll back Turkey into the Islamic age. To prevent this, he made the Turkish military the custodian of secular traditions. The Turkish military has intervened to upset any Islamist take of Turkey on many occasions during the last ninety years. It is quite possible the military will be called upon to take the reins of power once again, especially with the impending partition of Iraq and the coming of Kurdistan as an independent country with its destabilizing effects on Turkey’s Kurds and Erdogan taking advantage of this scenario to sideline the military to seize more power for himself and his Islamist party. With a Muslim at the helm in a non-Muslim Turkish clan, the conversion of the rest of the clan to Islam was only a matter of time. This was one of the tactics used by the Muslims to infiltrate Islam into the Turkish nation. By the middle of the eleventh century, most of the Turks had embraced Islam, and thenceforth it was they who became the vanguard of the Jihad to carry the bloodied trial of Islam into Anatolia and the Balkans. It was these Islamized Seljuk Turks who kept up a constant pressure on the Byzantine Empire inflicting on the Byzantines a string of defeats starting from the Battle of Manzikert in 1071 in Eastern Anantolia. It was these steady attacks and migration of the Seljuk Turks into Anatolia which gave the present Turkish character to Anatolia making it the Turkey of today. The Seljuk (and later the Ottoman) Turks also carried with them the tradition of taking child hostages and bringing them up as Muslims, a tactic of which they had earlier been victims at the hands of the Arab and Persian Muslims. This led to the institution of the Turkish Jannisaries The Jannisaries (Mercenaries from Jan = Life and Nisar = given away. The Muslims will have you believe that Janisarry comes from Yeni = new and Chery = soldier, but this is an eyewash meant to hide Muslim atrocities on non-Muslims) were Christian children taken captive by the Turks when they invaded Anatolia and the Balkans. The Jannisaries is a practice derived by the Turks from the Arab and Persian Muslims tactics used against them (the Turks) during their pre-Islamic days. But the irony of history is that the Islamization of the Turks and the Mongols also started their migration from the traditional homelands in the Steppes of Central Asia into Anatolia and onwards in the Balkans. Today the word Turk is not mainly identified with the Turkic peoples of Central Asia who make up the Kazakh, Uzbek, Khirgiz and Tajik people (all of whom were called the Turanians in ancient times). Today the word Turk implies an inhabitant of Anatolia which is called Turkey. But in ancient times the inhabitants of Anatolia were not the Turks, they were Hittites (and Indo-European people) who later mingled with the Greek speaking inhabitants who built the Hellenized kingdoms of Sardis and Troy. Returning to pre-Islamic Central Asia, we need to bring attention to another curious fact that today not many historians have pointed out that the subterfuge, savage cruelty and other foul tactics which the Muslims used to convert the Turks to Islam, had led to a gradual accumulation of bitterness and a desire for revenge against the Muslims in the Turks and their related clans the Mongols. Over the centuries many Persian Zoroastrians, the Persian Nestorian Christians, the Turks, Chinese and the Mongols had nursed within themselves a grievance against the Muslims expansion into Persia and Central Asia. It is this accumulation of grievances that led to the burst of the Mongol attack on Islamdom from 1200 that culminated in the sack and slaughter of Baghdad in 1258 under Hulagu Khan who was egged on to this path by his Nestorian Persian Christian wife. Historians have failed to interpret the attack of the Mongols on Muslim Persia, and the Middle East as the Turko-Mongol counterattack on Islam; as were the Crusades, a Christian counterattack against Islam in the 11th century, We shall examine this in detail in the chapter on the Mongol resistance to Islam. Suffice it to note here that Hulagu’s attack on Islamdom was a collective expression of resistance to Islam from the pre-Islamic Persians who had settled in China and Mongolia, and the Turks who had been waging a struggle against Islam in the 8th to the 10th centuries. It was a result of historical wrongs committed by the Arab Muslims on the Zoroastrian Persians, and by the Arab Muslims along with the Islamized Persians on the Turks, and in turn, by the Arabs with the Islamized Persians and the Islamized Turks on non-Islamic Turks and Mongols and Chinese. Ataturk’s first and revolutionary measure was to abolish the Caliphate. Thus with one stroke he dealt two blows to Islamic orthodoxy. With the Caliphate abolished by a Turkish nationalist military commander, Turkey was no longer the focus of the Islamic world. He severed Turkey’s most critical link with the Islamic world. Atatirk supplemented this with the abolition of the Arabic script and replaced it with the Latin script. He abolished the Chador (for ladies ) and Fez for men (Islamic cap with a tuft), and replaced it with Western dress. Women were to don Western skirts, while men were to be in Western three piece suits. 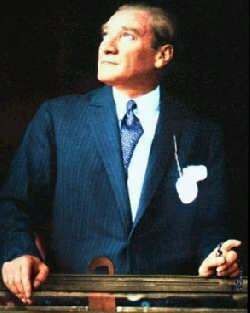 , Necmettin Erbakan and Tansu Ciller, etc. Most important of all, Ataturk visualized that in future there could be folks like Abdullah Gul and Erdogan who might want to undo the revolutionary secular reforms initiated by Ataturk and roll back Turkey into the Islamic age. To prevent this, he made the Turkish military the custodian of secular traditions. During the last ninety years the Turkish military has intervened to upset any Islamist take of Turkey on many occasions. It is quite possible the military will be called upon to take the reins of power once again, especially with the impending partition of Iraq and the formation of Iraqi Kurdistan as an independent country with its destabilizing effects on Turkey’s Kurds and Erdogan taking advantage of this scenario to sideline the military to seize more power for himself and his Islamist party.